Luca's career includes the famous 2 Michelin-starred restaurant "Il Luogo di Aimo e Nadia" in Milan and international experience at London's Millennium Gloucester Hotel, and in Australia at the Sheraton on the Park, The Westin and Cypress Lakes Resort. Luca is a consultant for restaurants, magazines and Italian brands in Australia and around the world, providing guidance and assistance in their daily operations. Soak mushrooms in hot water for 30 minutes or until soft. Combine water, yeast and oil in a large bowl, stir until combined. Fold through flour and salt until just combined, turn out onto a lightly floured surface and knead for 5–10 minutes or until a smooth ball forms. Place dough ball into a lightly oiled bowl, cover with cling wrap. Set aside in a warm drought free place for 3 hours or until dough has doubled in size. Turn dough out on a floured surface and knock back (punch) the dough to remove excess air, lightly knead. For a quick dough which is thicker use Basic dough recipe. Drain mushrooms and place in a small bowl with oil, garlic, parsley, salt and pepper. Roll teaspoons of sausage into small balls and flatten. Divide dough into four balls. Roll out one piece of pizza dough to form a 24–26cm disc and place onto a large square of baking paper. Divide toppings evenly into four. 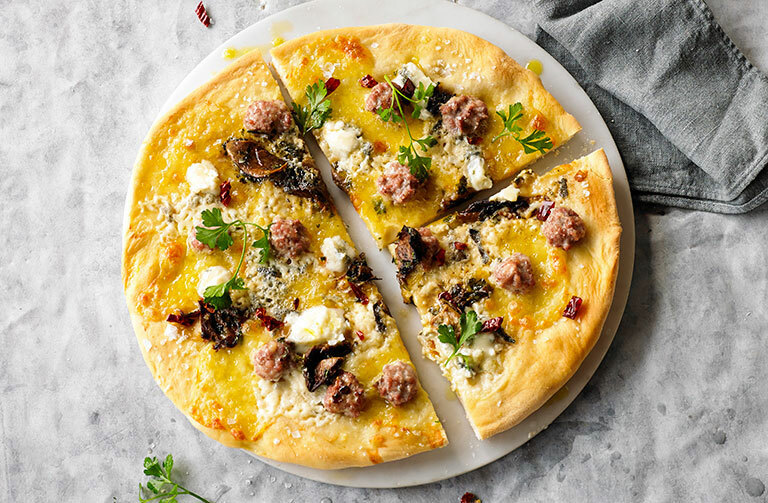 Top base with mushrooms, sausage, mozzarella and gorgonzola. Open lid and slide paper out carefully. Close lid and for cook for 6–8 minutes or until cooked to your liking. Top with chilli flakes, extra parsley leaves and drizzle with extra virgin olive oil.